It may seem like Amazon is dominating all areas of retail, but a number of others in the space are giving the e-commerce giant a run for its money. Target, Costo, Lowe's and Ulta Beauty are among the retailers that have posted double-digit gains this year — rising roughly 22%, 18%, 25%, and 43%, respectively. By comparison, shares of Amazon have gained about 23%. 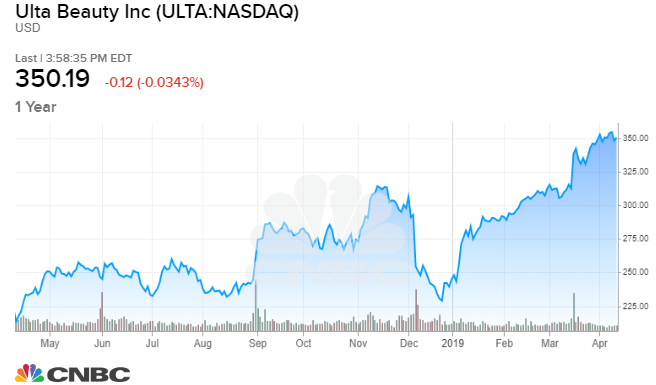 Erin Gibbs, portfolio manager at S&P Global, says Ulta Beauty — the group's top performer this year — is the stock to own going forward. Ulta "actually has a strategy that's almost the opposite of Amazon. It actually keeps expanding its brick-and-mortar stores," Gibbs said Thursday on CNBC's "Trading Nation." "One of the reasons it works so well is it has the largest product offerings, so the largest number of products for any beauty store, and it's able to partner with really unique cosmetics and beauty products that nobody else can get." In addition to the specialized products and experiences that the physical store offers, Gibbs also likes the company for its expected 11% profit growth over the next two years. The stock climbed to a new all-time intraday high this week, about a month after the company beat analyst expectations on earnings and revenue for the fourth quarter. The beauty retailer also reported a 9.4% increase in same-store sales, thanks in part to the company's exclusive brick-and-mortar distribution deal for Kylie Jenner's popular cosmetics line. In the last 10 years Ulta stock has gained roughly 4,820%, while shares of Amazon are up about 2,210%. 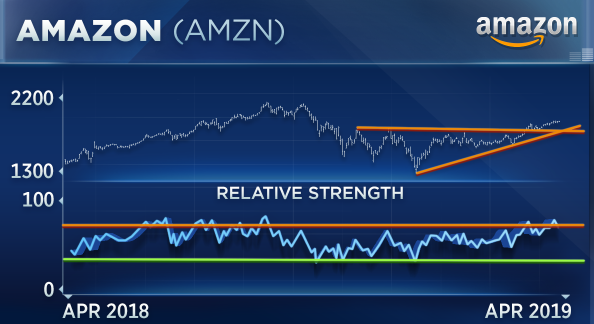 From a technical perspective, however, Newton Advisors' Mark Newton says Amazon can continue to outperform. He believes the stock will soon regain its $2,050 all-time high level from September, and with the stock currently trading about 10% below that price, he believes investors should use pullbacks like this one as a buying opportunity. "I still like Amazon quite a bit. … It's quite a bit off its highs, and that's precisely why I like it," he said on the CNBC segment. "Take a look at its broader chart going back since October. The stock has really been range bound for the last six months, so it's really just started to emerge from that base." "So if anything, it still looks like it has room to run over the next three to five months. So I'm projecting a move back up to $2,050 and really would use pullbacks as a chance to buy this." On Thursday, the battle between Amazon and its competitors heated up after Jeff Bezos, in his annual letter to shareholders, challenged other retailers to match the Seattle-based company's pay and benefits. Disclosure: S&P Global holds shares of Ulta Beauty.